A few years ago when my husband was working construction I made a batch of brownies for him to share with the guys he worked with. There was one man he was good friends with that mentioned he hadn’t had traditional brownies in years. His wife was a bit of a health nut and she always made brownies with— black beans!! What?! How weird is that?! How do you even do that? How do you even call them brownies when you put BEANS in them?? Not just beans, but black beans. The most pungent, strongly flavored bean there is. I just couldn’t understand it and I was definitely not going to try it. Didn’t just try it once. Tried it twice. I actually made two different batches and tweaked the recipe a bit after the first. Today I’m going to share the second version of the recipe for Salted Brown Butter Brownies. I swear to you that you will not even know they were made with black beans!!! Well, I’m not lying. Here’s my proof. If you know my hun in real life, then you know what a ridiculously fussy, picky eater he is. He doesn’t like anything that grows in dirt, with the exception of the mighty potato. He likes a few things that fall from trees, but mostly only things that were once breathing, along with pasta and bread. He hates, hates, HATES black beans. Like, absolutely will not even be in the vicinity of black beans because he will gag. For reals. So what did I do? I made a big ol’ batch of black bean brownies and then gave him a gooey chunk without telling him the one thing he loathes was the main ingredient of course!! That is a big deal peeps!! Yes, that is the extent of his excitement when it comes to dessert, so don’t focus on that. Focus on him saying so what it’s a BROWNIE!! These Salted Brown Butter Brownies are not exactly like a traditional brownie. They are super fudgy but because of the lack of flour they are not chewy. But they are very dense and chocolatey! A few tips for these brownies. Be sure you brown the butter. The first batch I didn’t brown the butter long enough and it made a noticable difference when done properly in the second batch. Also use salted butter as it makes a world of difference in flavor depth. 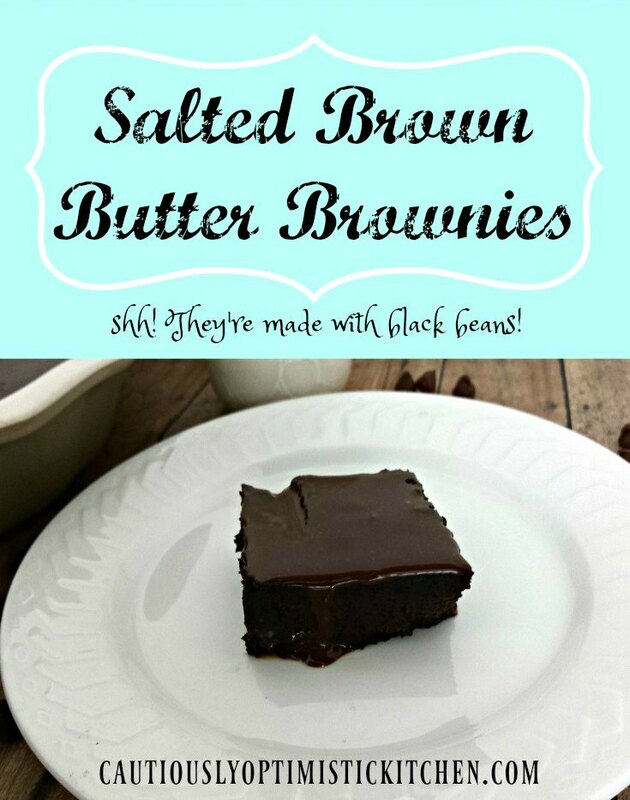 Of course unsalted would work too, but the salted butter is what makes them Salted Brown Butter Brownies! Once they are cooled to room temperature store them in the refrigerator. They are best when they are cold and even better when they have had a chance to develop flavor by setting. Don’t get me wrong! They are so good right out of the oven too, but the flavors meld together and are even better the next day. Make these in a food processor/blender to make clean up really easy! Puree black beans in food processor or blender (or mash with a fork). Mix black beans, eggs, oil, butter, and vanilla. Add cocoa powder, sugar, baking powder. Pour into a greased 8x8 or 9x9 pan and bake about 30 to 40 minutes at 350, until center is no longer gooey (test with a toothpick or knife). Once cooled melt chocolate chips and heavy cream together to make a ganache. Spread evenly over brownies. Be sure to Pin this so it will be handy when that chocolate craving hits!